Ramadan Calendar with Ornaments – Hello Holy Days! 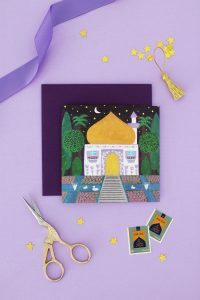 If you’re looking for a DIY Ramadan calendar idea, make this pretty Ramadan calendar with ornaments! Although Ramadan doesn’t fall anywhere close to Christmas in 2018, you can purchase plastic ornaments online from Oriental Trading year round. Inside each ornament is an act of kindness written on a small piece of paper. 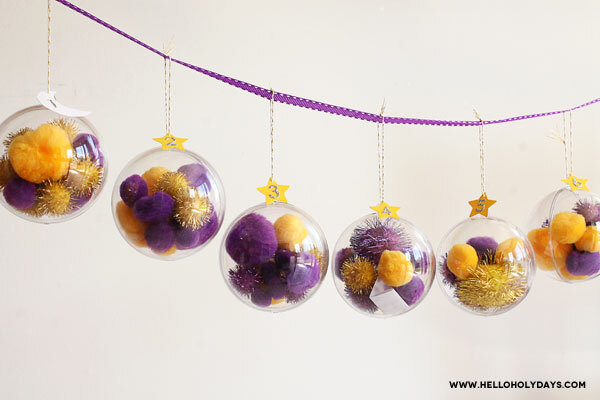 However, to make opening the ornaments more fun, I filled each ornament with purple and yellow pom poms (the colours of Ramadan.) 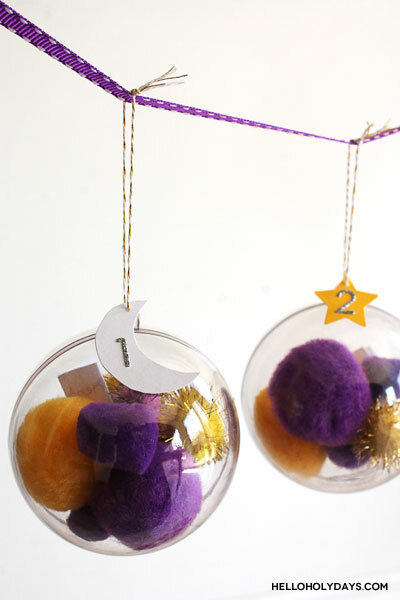 The pom poms make the ornaments look super fun and pretty – plus I love the texture and softness of pom poms. They’re perfect for kids ages 4+. 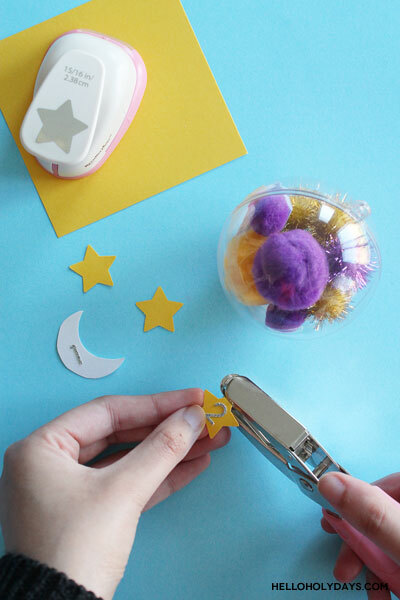 (Not to mention, poms poms are easy to clean up once the ornament is opened.) Here, I’ve hung the ornaments in a garland so this countdown calendar can double as decor for the living room or the kids’ room. Just make sure that if you’re hanging all 29/30 ornaments together as one garland, you use really strong hooks to hang the garland. Write out 30 acts of kindness/ good deeds on a plain white sheet of computer paper. Cut each one out and fold up. 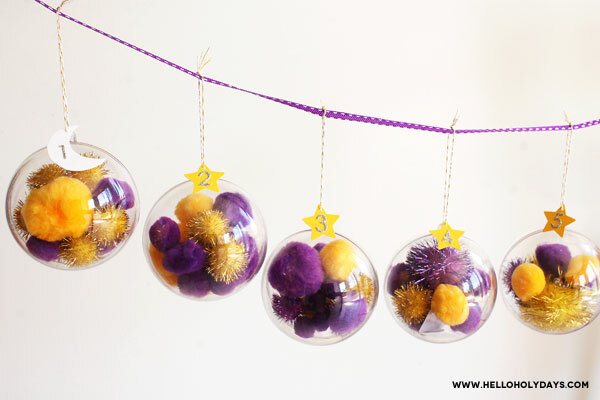 Fill a clear plastic ornament with purple and yellow pom poms. Add the folded up sheet with the act of kindness written on it. Repeat 29 more times with the rest of the ornaments. Thread twine through the star and then thread the twine through the ornament. Tie a knot. Repeat for all ornaments. Hang all ornaments on purple ribbon and display the garland. Special thank you to Oriental Trading for providing the ornaments for this crafts! *Please note all Hello Holy Days crafts are for personal use only, they should not be made or adapted for commercial purposes.